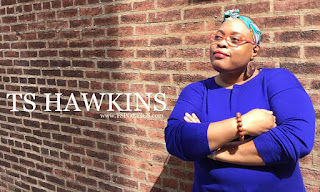 March 2019 – TS Hawkins appeared on WURD Radio to celebrate Womynx+ History Month and chat about mentorship, poetry, and activism! Hawkins had a groovy time speaking with Dr. Aaron Smith and Kwasa Mathis! 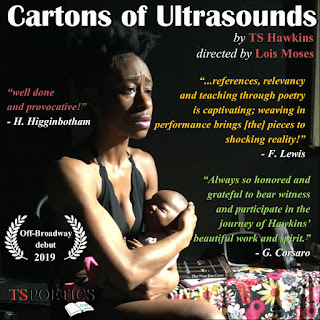 Cartons of Ultrasounds, by TS Hawkins, debuted off-Broadway for a limited run! A choreopoem experience highlighting how scantily clad images, pejorative song lyrics, and abusive homes heighten the maltreatment of the female form; teaching womyn to be the missing and the forgotten, first devised in 2012, during Alphabet Arts "Puppets & Poets" Residency at the Brooklyn Arts Exchange (BAX) then supported by InLiquid's 2018 Winged Woman: Three Perspectives exhibit at the Painted Bride Arts Center in Philadelphia, PA opened at The TANK under the direction of Lois Moses and featuring Ciani Barclay! It was a boon to have enriching conversations with the audience as Cartons of Ultrasounds continues to elevate the communal consciousness. Fun tidbit: In 2013, Cartons of Ultrasounds was adapted by Broad Daylight Productions in Singapore! WATCH Silent No More; a short film by Charlese Hawkins! 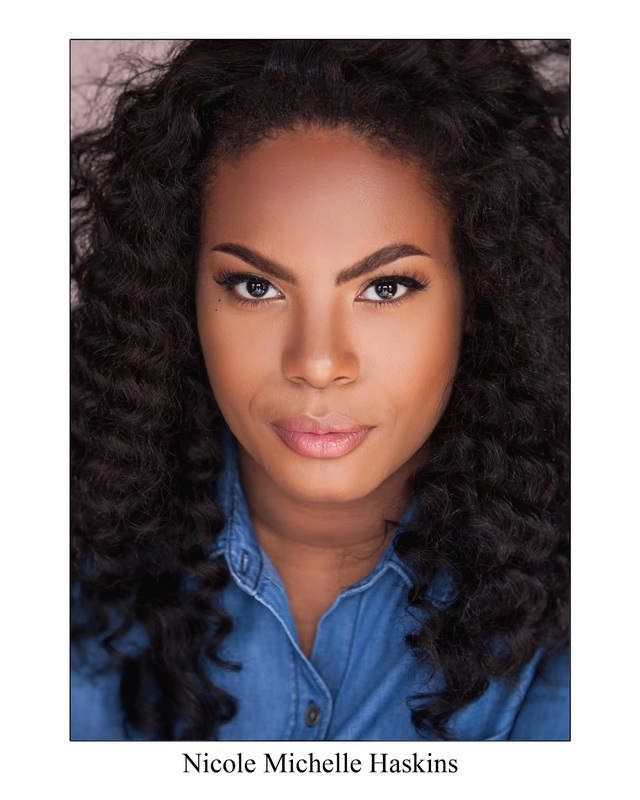 Ring of Keys; a national network of queer women, trans, and gender non-conforming artists working on and offstage in musical theatre accepted TS Hawkins to be a member! Click here to check out Hawkins’ listing! 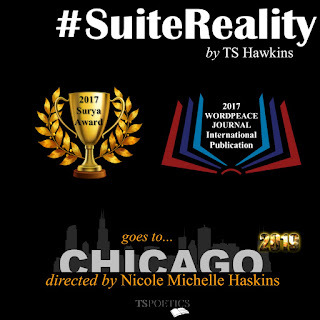 April 2019 – After being honored by a 2017 Surya Bonaly "Reality Check" Award and an international publication in WORDPEACE Literary Journal, #SuiteReality will debut in Chicago under the direction of Nicole Michelle Haskins for the #BlackLivesBlackWords I AM...Festival on April 27-29th at the Goodman Theatre! #SuiteReality is a choreopoem experience that touches upon Women's Rights, Black Lives Matter, and #SayHerName; a campaign that highlights womyn who have been killed by the fragility of masculinity and police brutality. I AM…Fest will consist of an educational program as well as an artistic program to introduce audiences to activists, art leaders, and playwrights from around the globe; hosting a series of leadership development workshops, panel discussions with some of the most exciting and innovative entrepreneurs and creatives, as well as placing a spotlight on lesser-known plays from some of the most exciting international Black female playwrights. TS Hawkins will be heading a poetry residency for Theatre Exile’s “Out of Exile” educational program. This project, geared towards residents of South Philadelphia, will culminate in a showcase highlighting the topical concerns of the community. Stay tuned for performance details! May 2019 – TS Hawkins is slated to appear in The Bridge PHL Theatre Festival Spring Cabaret on May 10th at L’etage; 730PM. Tickets are $10! Come see the new wonders Hawkins’ will unleash! 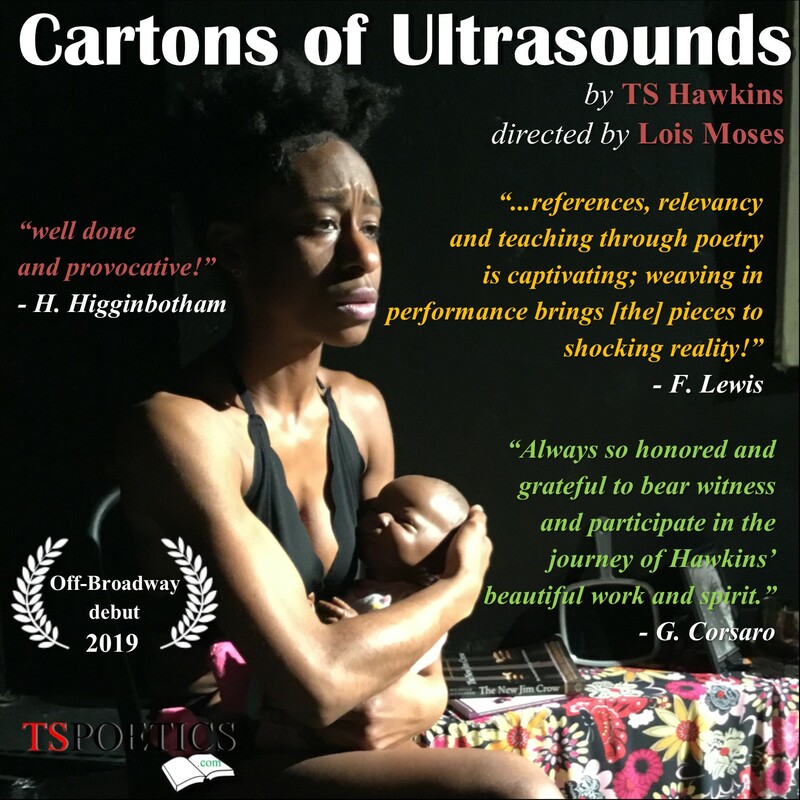 On May 31st, TS Hawkins returns to the New York stage for Roses and Bread 24th Annual Women’s Open Poetry and Performance Event. Proceeds from this performance will be donated to Rojava: Kurdish Women's Movement. 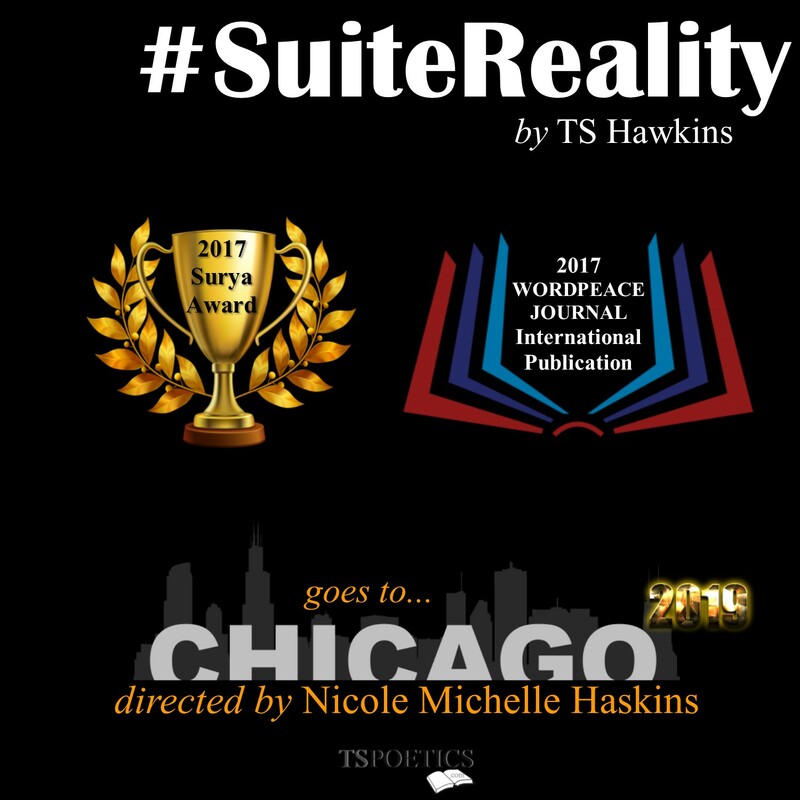 After being honored by a 2017 Surya Bonaly "Reality Check" Award and international publication in WORDPEACE Literary Journal, #SuiteReality debuts in Chicago under the direction of Nicole Michelle Haskins for the #BlackLivesBlackWords I AM...Festival April 27-29th! TS Hawkins is an international author, performance poet, artivist, and emerging playwright. Plays & short works include: Seeking Silence, Cartons of Ultrasounds, Too Late to Apologize, They’ll Neglect to Tell You, #RM2B, The Secret Life of Wonder: a prologue in G, AGAIN, #SuiteReality, and “don’t wanna dance with ghosts…”. Hawkins’ one-act choreopoem, AGAIN, was acknowledged for having the "Best Theater Moment of 2017" along with #SuiteReality receiving the 2017 "Reality Check" Surya Bonaly Award. Books include: Sugar Lumps & Black Eye Blues, Confectionately, Yours, Mahogany Nectar, Lil Blaek Book: all the long stories short, and The Hotel Haikus. Hawkins is most known for the Poetry Master Class, "Thriving Ain't Easy"; a course that infuses health, wellness, and activism through poetry. I AM…Fest will consist of an educational program as well as an artistic program to introduce audiences to activists, art leaders, and playwrights from around the globe; hosting a series of leadership development workshops, panel discussions with some of the most exciting and innovative entrepreneurs and creatives, as well as placing a spotlight on lesser-known plays from some of the most exciting international Black female playwrights. This pioneering festival will culminate in our celebrated Black Lives, Black Words International Ten-Minute Play showcase entirely written and directed by Black Women. This revolutionary event will culminate with a closing performance of 100 Women of Color performing the USA premiere of ‘The Interrogation of Sandra Bland’; a transcript of Sandra Bland’s arrest transcribed by Black British playwright Mojisola Adebayo and directed by Simeilia Hodge-Dallaway, a noted Black British theatre director and Co-Founder of Black Lives, Black Words International Project.